Explora is an association of the ECE department of SSET that aims at creating a platform for blooming minds to come forward and express their inspirational ideas and talents. Its name is the imperative form of the Spanish language verb explorar which means to explore. The venture explora originated in the minds of the aspiring electronics engineers of SSET as an abode for expressing and sharing their innovative ideas and to pave way for creative thinking. 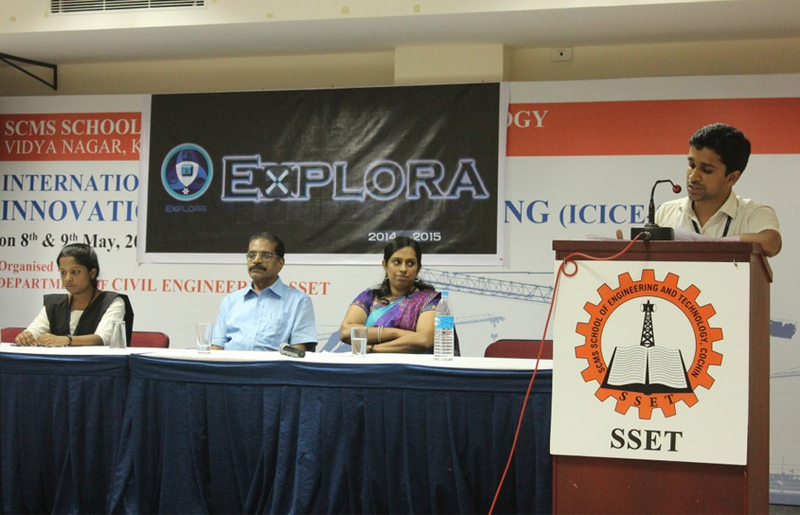 Explora started in the year 2008 under the guidance of our HOD Prof.R. Sahadevan and Staff Coordinator Mrs. Sreeja. K. A. A magazine was released as the first step towards the successful journey of this association showcasing articles and journals from different genres. The student's association of ECE department involves in activities to encourage the students to explore wide possibilities in the field of electronics and communication. As part of the club activities a research desk was organised that conducted various studies and research activities. In the succeeding years a technical forum was incorporated to include paper presentations, electronic workshops, project exhibitions etc. as part of the club activities. Two newsletters are released every year prior to the release of the yearly magazine. The success story of explora is into its 9th year now and may it inspire many exploring minds in this journey. Toinspire the students to explore new trends in electronics industry. To engage the students in activities which help build positive attitude towards life. To provide a platform to showcase the technical and artistic skills.